Feedback: 9 comments - leave yours! 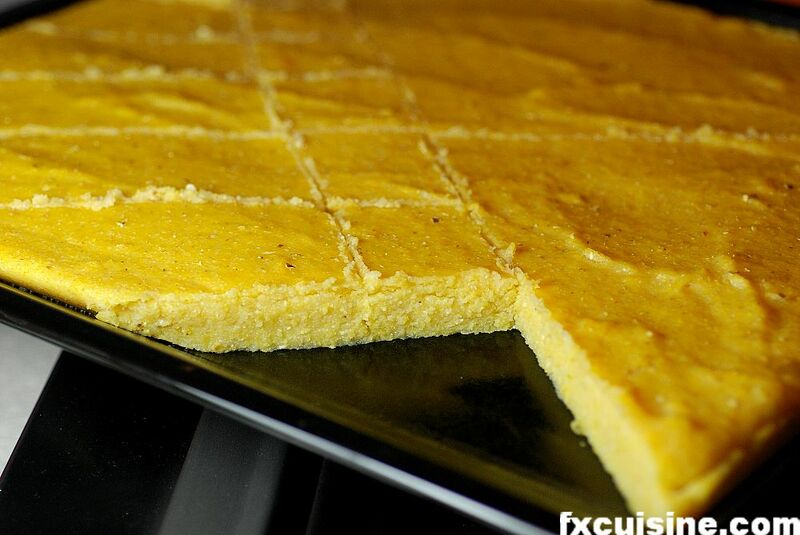 You don't need to wear Birkenstock or have a nuclear shelter in your backyard to want to mill your own polenta. Some people do it for self-reliance, others because it's healthy. I do it out of pure gluttony. 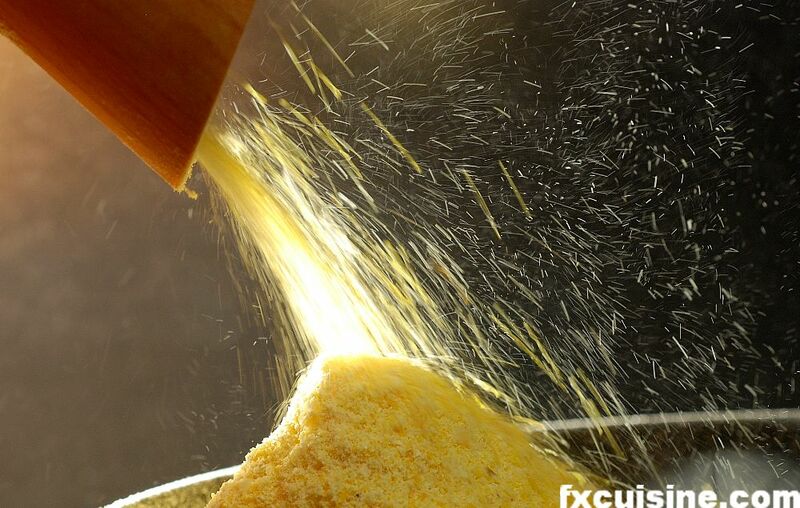 Polenta is corn kernels ground to a coarse flour. 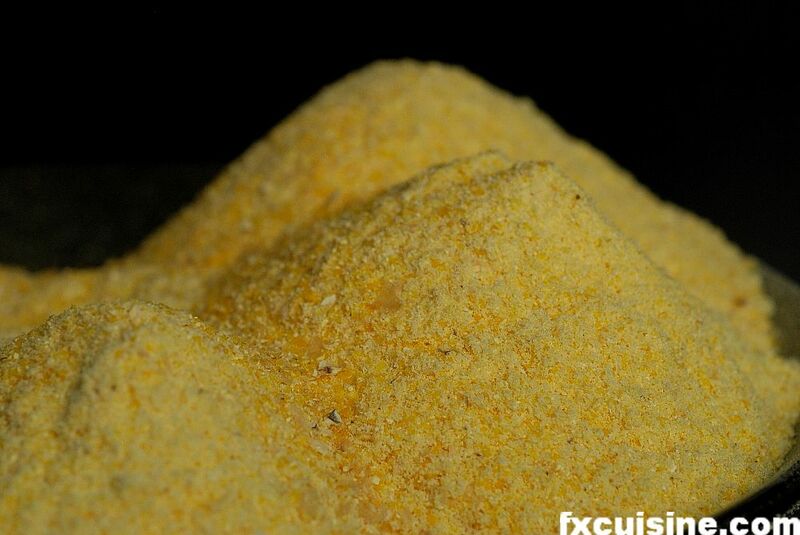 The polenta sold in shops is a vamped-down shadow of the real stuff. Commercial mills have to remove some of the tastiest parts of the grain so the polenta will last more than a few days before turning really rancid. Most will precook and preseason it, so you're left with a sort of stale yellow industrial porridge. A meal fit for a donkey. Mario Battali served me the Kool-Aid on milling your own flour for pasta making. Well, the ladies at the River Café in London convinced me to do the same for polenta. 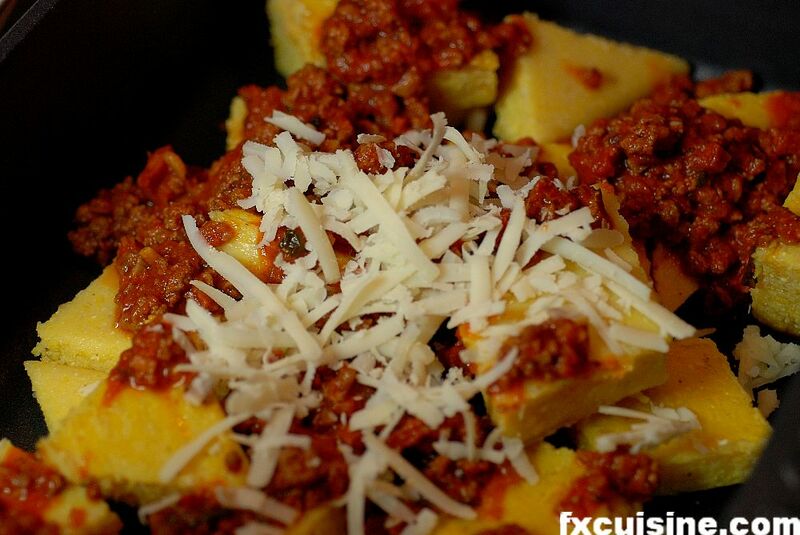 They claim Italians eat polenta only a couple months after the harvest - after that stone ground polenta turns rancid. 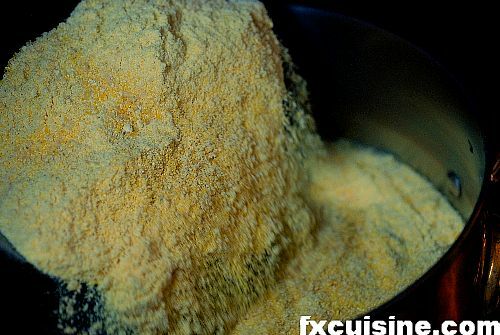 Stone-ground polenta is not easy to find outside Italy and I like it all year round, so I decided to mill my own. These days home flour mills sell for $200 on Amazon. 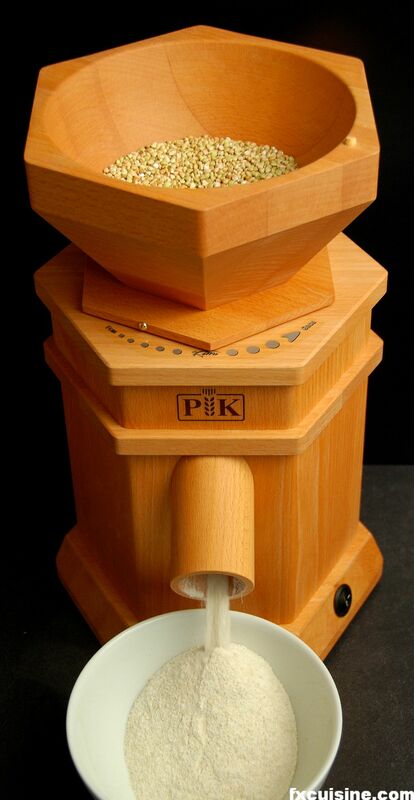 I have a beautiful beech wood Komo mill from Austria, my pride and joy. See a picture in Italian Buckwheat Noodles. Put in dried corn kernels and turn on the mill. Adjust the fineness and sit back. The mill starts spitting out fresh polenta like a cascade of sparks. 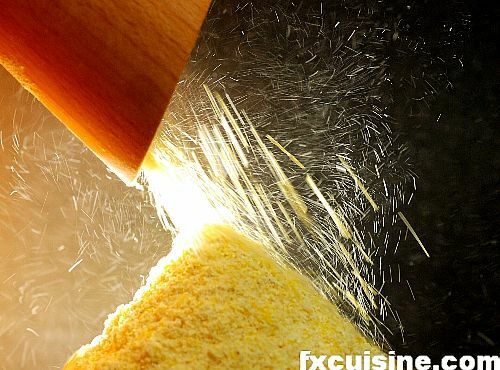 500 gr polenta is milled in 3 minutes flat. This is a close up view, the whole mill is about 35cm/1' high (photo of entire mill). You can mill the polenta more or less fine. I like it coarse. It comes with bits of corn bran. The catch is the cooking time - 3 hours. 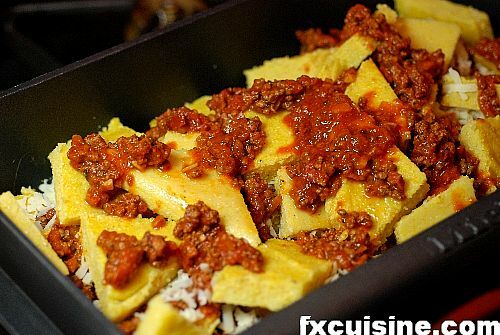 Cooking polenta is very simple - boil it in 4 times as much liquid for a very long time over very low heat. Mario Batalli recommends washing freshly-milled whole-grits polenta in fresh water and then filtering through a cloth to remove excess starch. For outstanding result you'll need to add some fat. Either a piece of butter in the liquid at the beginning, or replace half the water with full-fat milk, or mix in butter and freshly grated parmesan cheese at the end. 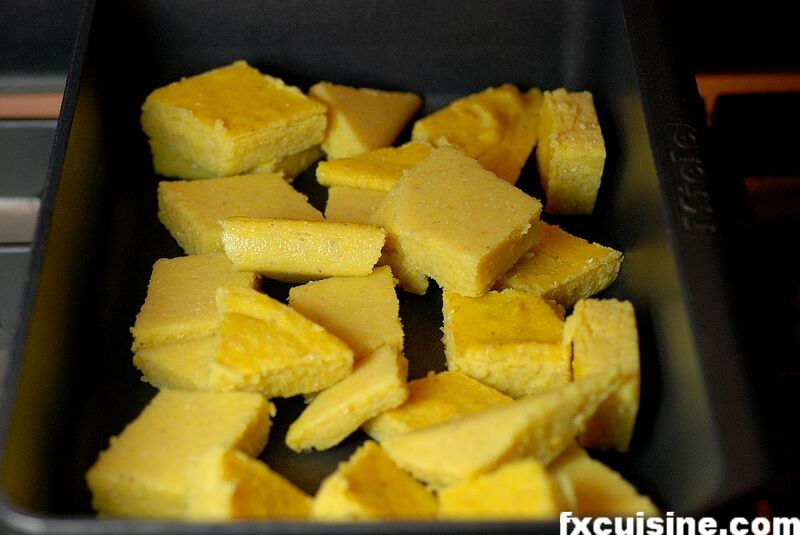 Cooked polenta is a gel with 75% liquid and 25% flour. If you use water it will taste watery. 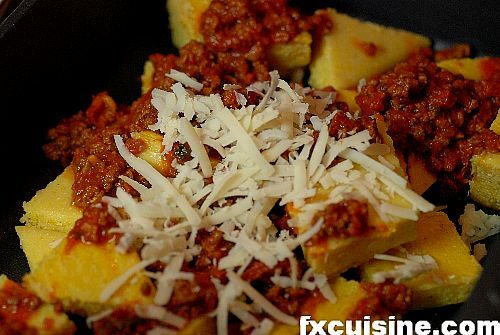 The fat is hidden - your guests will never see the calorie price tag attached and will only remember this as the best polenta they ever had. In a heavy-bottomed saucepan heat the water/milk with 2 teaspoons salt. 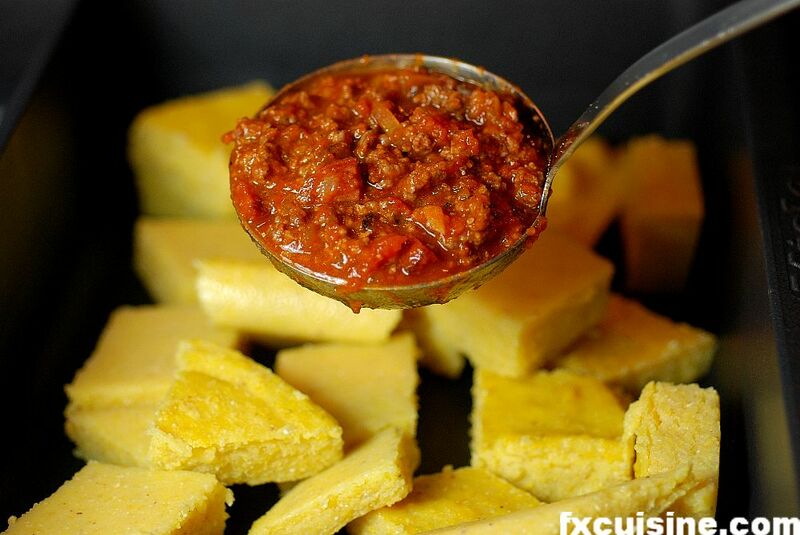 Add the polenta in a shower and beat well to dissolve any lumps. 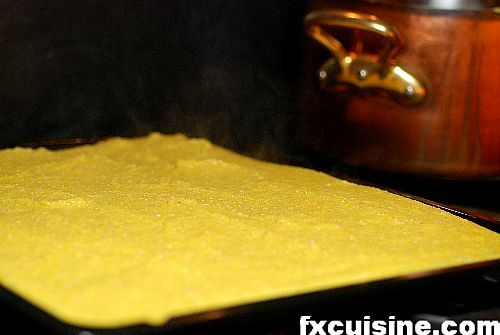 Don't wait for the water to boil before adding the polenta or when you pour the polenta in your pot will turn into a yellow volcano and spit scorching-hot polenta drops all around your kitchen. 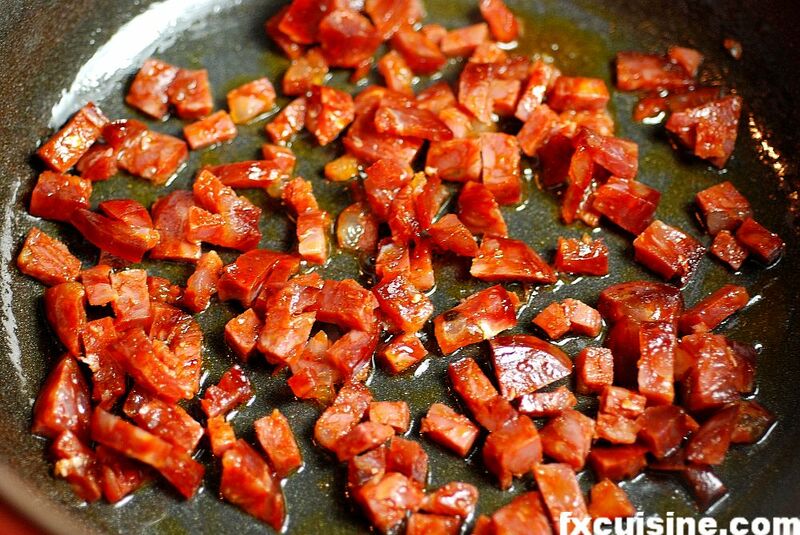 Increase heat to high while whisking often to dissolve any lumps. 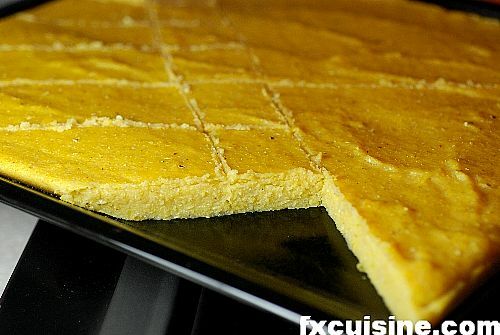 The polenta will initially split into a yellow layer at the bottom, water in the middle and some white bran on top. Just mix regularly and make sure it doesn't stick to the bottom. When it boils, decrease temperature to the lowest flame possible. After 15-30 minutes the polenta will be a nice homogenous mix. Then just leave it for about 3 hours and mix from time to time. Once the polenta reaches this stage it does not require constant mixing unless you have a very hot stove that could burn the bottom. 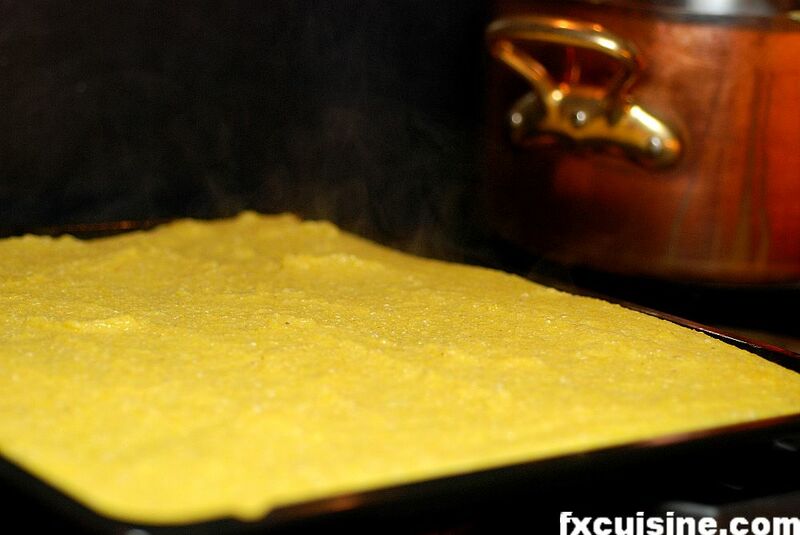 Polenta is cooked when it falls off the pot's sides and is a thick, dense yellow paste. You can then mix in 100gr butter or 150gr finely grated parmesan cheese. These are often omitted but the polenta just tastes a whole lot better with added fat - one of them facts of life. 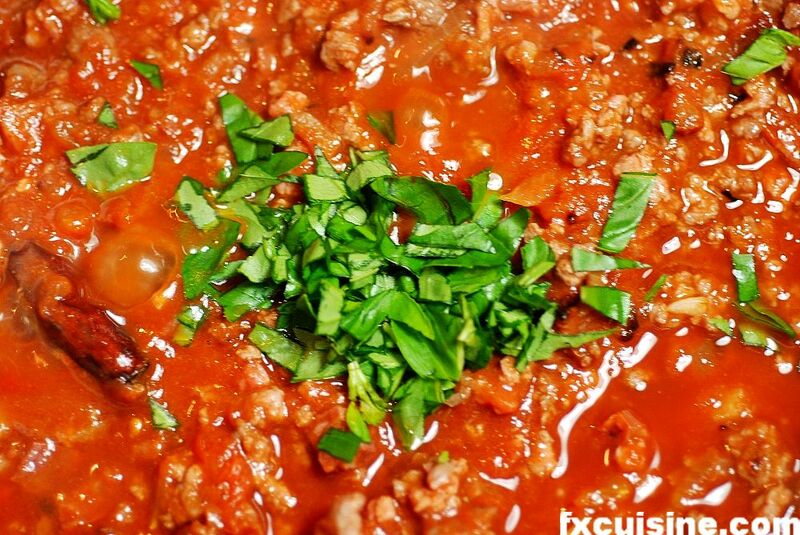 While the polenta cooks, prepare the ragù or meat sauce. Crumble or chop the sausage into tiny cubes and fry it on medium high in a dutch oven. 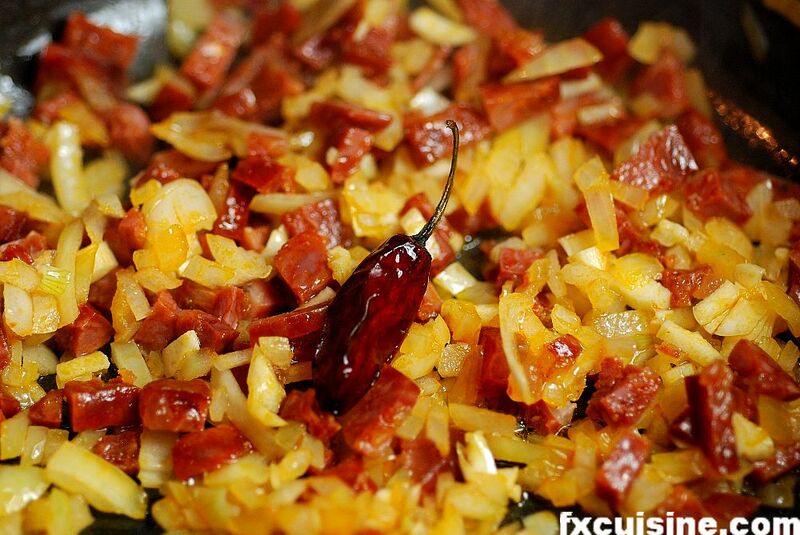 When the sausage has rendered some fat, add the chopped onions and garlic (photo). 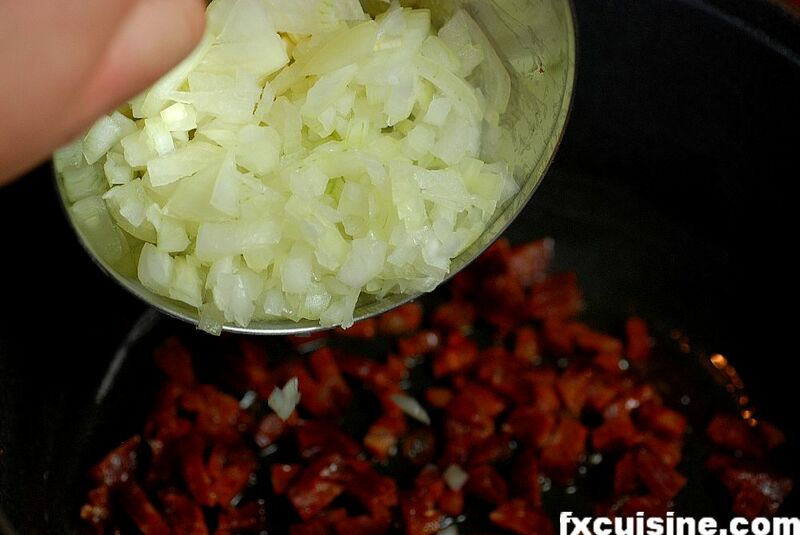 Continue to fry until the onions are soft. Add the dried chili and ground beef and fry with the onions until the beef is browned on all sides. 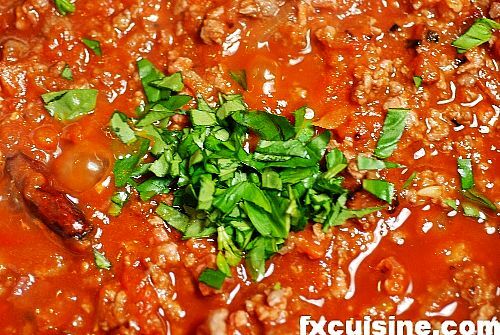 Add chopped basil and a little salt and leave on a very low flame for at least one hour, adding a little broth or water from time to time if it becomes too dry. Grease a large baking tray with a little butter or oil on a paper towel to prevent any sticking. Pour the hot polenta into the tray. Let it cool down in the fridge for at least one hour. As it cools down the polenta sets. Cut it in 8cm/3'' long rhombuses with a plastic or wooden knife so as not to damage your baking tray. 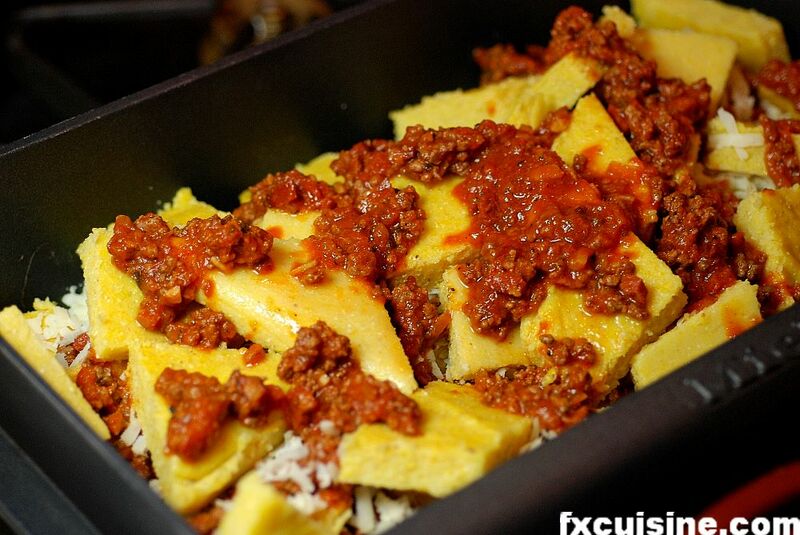 Place a layer of polenta rhombuses in a large oven proof dish (photo) and cover with a ladleful of ragù. 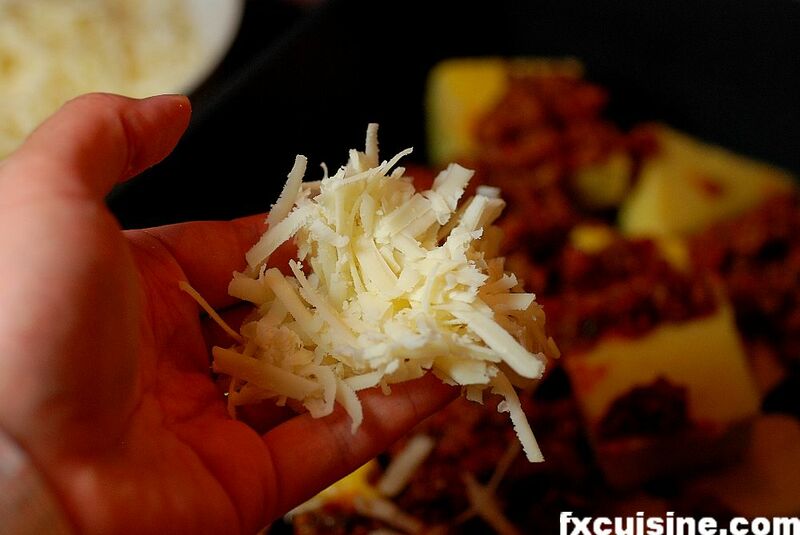 Sprinkle coarsely grated pecorino cheese (photo). 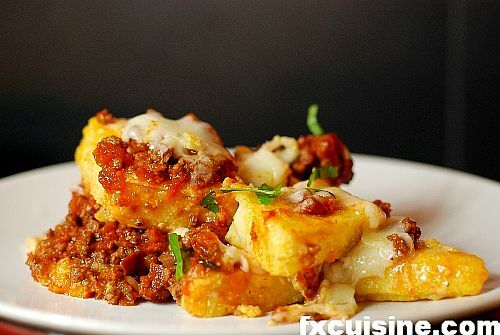 Continue with another layer until you run out of ingredients. Bake in the oven until the cheese is fully melted, about 20 minutes at 150°C. Serve with finely chopped basil and a few whole basil leaves for the decor. 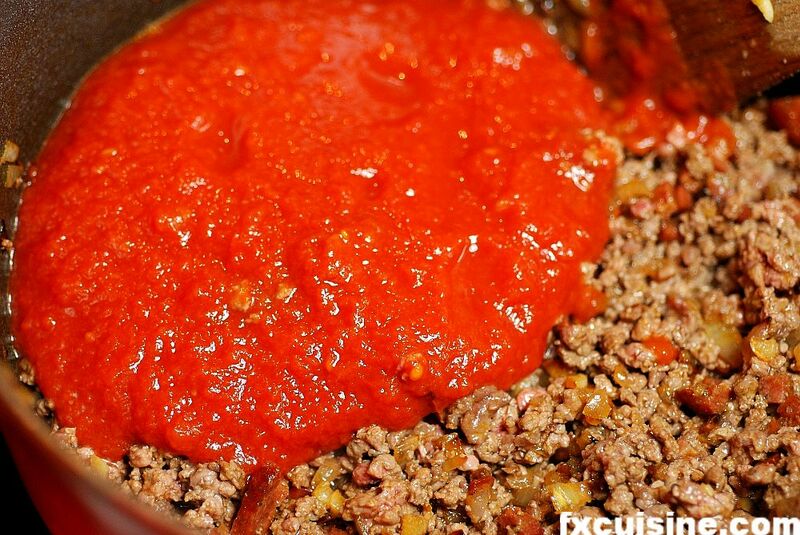 This is a wonderful traditional Sardininan recipe which I found in an italian book with 5000 traditional regional italian recipes. 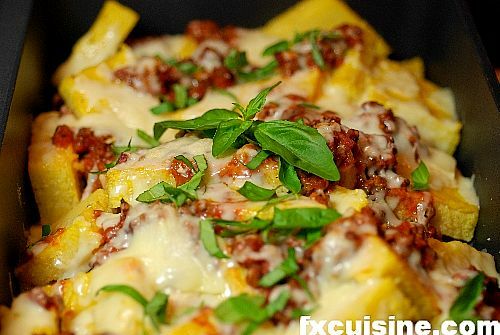 The rich meat sauce and melted cheese combine with the rustic and complex flavor of the freshly milled polenta and fresh basil in a moment of pure delight. Another success in FXcuisine! Oh, this makes me SO hungry! I now have two uses for the grain mill I bought, thanks to this recipe and the one for buckwheat noodles and cabbage, yum. Is there an alternative to the flour mill (e.g. food processor or blender)? 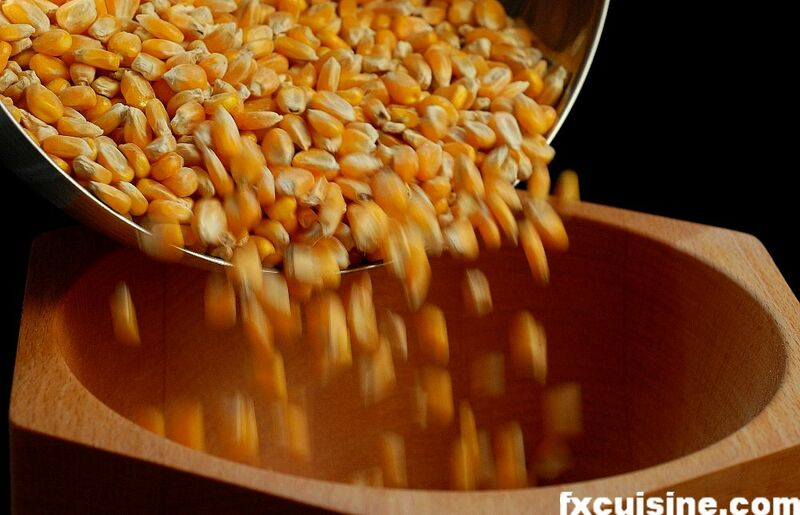 Will the use of a food processor or blender on dry corn simply destroy the items mentioned? Jenny, I have recently been offered cookies with rice flour made by grinding flour in a food processor and they were not overly convincing. Grinding hard corn kernels into a fine, regular powder is a full time job and I don't think anything but a proper mill can do it. They are not expensive though and you can buy them off the web. 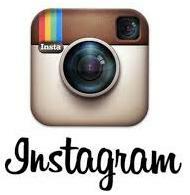 I hope you'll have a chance to try - good luck and thanks for visiting! I have never eaten Polenta, but when I discover this web site my mouth is full of water... any way what is the benefits of polenta... is it healthy? I have an old Magic Mill with grinding stones. I'm wondering what sort of corn you used to grind into your polenta and if it's different from regular popcorn, can you list a resource online? Thanks. Annette, I am not sure whether popcorn corn goes through any processing that would make it less usable for polenta. But you can buy whole corn kernels from any organic store, there must be thousands of them that sell online in the US. Just look for 'organic corn kernels' on Google. Good luck! I have used freshly ground popcorn to make polenta, I liked the result.